Before discussing on deadlocks, lets see type of locks and their acquiring methodolgy in PostgreSQL. RowShareLock : It acquired automatically by a SELECT...FOR UPDATE clause. It blocks concurrent ExclusiveLock and AccessExclusiveLock on the same table. RowExclusiveLock: It acquired automatically by an UPDATE, INSERT, or DELETE command. It blocks ALTER TABLE, DROP TABLE, VACUUM, and CREATE INDEX commands (ShareLock, ShareRowExclusiveLock, ExclusiveLock, and AccessExclusiveLock) on the same table. ShareLock: It acquired automatically by a CREATE INDEX command. It blocks INSERT, UPDATE, DELETE, ALTER TABLE, DROP TABLE, and VACUUM commands. (RowExclusiveLock, ShareRowExclusiveLock, ExclusiveLock, and AccessExclusiveLock) on the same table. 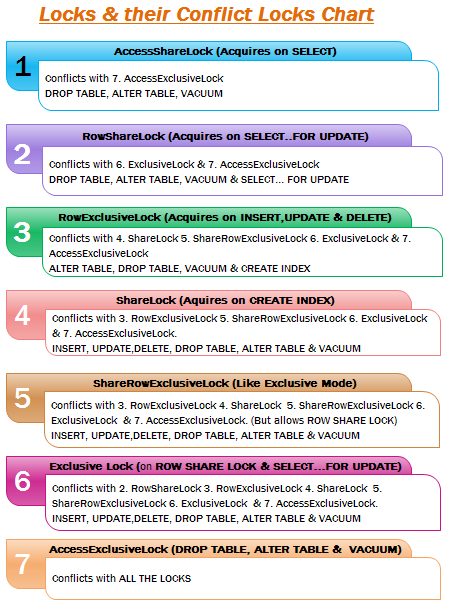 ShareRowExclusiveLock: This lock mode nearly identical to the ExclusiveLock, but which allows concurrent RowShareLock to be acquired. AccessExclusiveLock: It acquired automatically by a ALTER TABLE, DROP TABLE, or VACUUM command on the table it modifies.This blocks any concurrent command or other lock mode from being acquired on the locked table. Two types of row-level locking share and exclusive locks. Don't fall into confusion of LOCK naming, you can differentiate row-lock and table-lock by the column 'lock_type' in pg_locks. Exclusive lock: It is aquired automatically when a row hit by an update or delete. Lock is held until a transaction commits or rollbacks. To manually acquiring exclusive-lock use SELECT FOR UPDATE. Share-Lock: It is acquired when a row hit by an SELECT...FOR SHARE. Now Deadlocks, you have seen the lock modes and their lock aquiring methodology, there are situations some of the transactions fall under deadlock. I believe application designing is the culprit forcing transactions to deadlocks. Deadlock mostly caused by ExclusiveLock's i.e., UPDATE or DELETE. Process A holding lock on object X and waiting for lock on Object Y. Process B holding lock on Object Y and waiting for lock on Object X. At this point the two processes are now in what's called 'deadlock' each is trying to obtain a lock on something owned by the other. They both will wait on each other forever if left in this state. One of them has to give up and release the locks they already have. Now, deadlock detector comes into picture and allow one process to success and another to rollback. To over come deadlock, design application in such a way that any transaction UPDATE or DELETE should succeed with complete ownership on the table. Lock the table with 'SHARE UPDATE EXCLUSIVE MODE' or 'SELECT...FOR UPDATE' or 'ACCESS EXCLUSIVE MODE' and complete the transaction. In this model, deadlock detector never throw that it has hit by a EXCLUSIVE LOCK's. You can test the scenario given in the pic above with the resolution, you see that deadlock detector never throws error. I always envy you for presenting Concept in pictorial way. Good one. However, one point for you. Deadlock happens when there is lock request cycle forms and none process in Cycle is ready for giving lock to other process. Hahah.. Thanks Vibhor. Keep some envy, lot more queued up, no time to present :). Agreed. That is the point for the deadlock concept. Thanks very informative.. Can u explain how postgres handles deadlocks. Is there any configuration parameter which terminate queries which are in deadlock.. deadlock_timeout is suppose to log and detect deadlock i hope. As I said, deadlock will be detected in the given time in deadlock_timeout parameter, after that one transaction will be succeeded and next will be rolled back. Note: This query for PG 9.2 and above, tweak it according to your PG version. After looking to the result you will know what is being blocked. Accordingly, release the exclusive locks to continue with other locks. For faster replies, you can take your queries to Pgsql-general forum. will select query creates any locks? I am trying create table where I am adding FK constraint for district table. Its OLTP application and district is reference table which is being used by many users online. My create table statement fails with deadlock error. What type of lock select statement creates? If the same table I create without FK no error. How can we use select to avoid any locking? Well, the primary way to avoid deadlocks is not to lock everything as early as possible, but to process things in a well-defined order. At least at this point you are wrong, I think - it is easy to produce a deadlock by doing two SELECT ... FOR UPDATE statements in a different order. Yes I agree with you, it should be processed in well-defined order to avoid deadlocks. However, my saying was, DEADLOCK occur if you are trying to take for two EXCLUSIVE LOCKs, in case of SELECT FOR UPDATE the transaction allows others to READ those rows and it completes with full ownership. As a mater of fact, SELECT FOR UPDATE in two session in any RDBMS is complete lock.